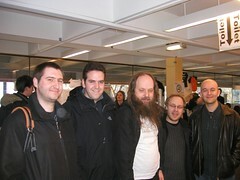 This weekend I attended FOSDEM with a few friends of mine. We ended up taking this group-picture with Linux kernel hacker Alan Cox! Takis, you still are the most ugly one of them all :-).